Telenor brings an amazing service for its cellular operators who have passion of Football. 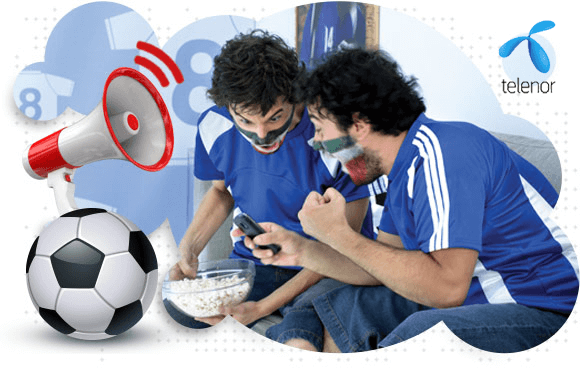 Now all the cellular operators who are connected with this network can easily get Football alerts within one second by using Telenor Football alert service. As we all know the popularity of Football sport is increasing day by day and there are lots of young generation really like for watching various foot super league. There are lots of young generations who really like to check updates various football matches and the popularity will be increased when Fifa World cup starts. Now this telecommunication is providing an exceptional Football update facility for its valued subscribers of Pakistan and all the cellular operators who have connection of this network can easily avail this service in reasonable charges. If you are far from your Television and want to check Football match result so just need to activate this feature and get complete details of match within seconds. It provides multiple things of football match and subscribers can receive all updates within seconds. This telecommunication always introduces packages with cheap charges and at this time it has launched this service with astonishing subscription fees all subscribers can activate this offer without any issue because the charges are extremely low and all the cellular operators can easily afford this feature for using in Football season. The details of this service are given as below. My Team News/ Articles Update. Customers can activate three days package by dialing *345*811#. Customers can activate weekly package by dialing *345*812#. Subscribers can subscribe monthly package by dialing *345*813#. Monthly Package is only for single tournament and league. Subscribers receive confirmation message from help-center after activation. The charges of three days package are RS 10 plus tax. The charges of weekly package are RS 20 plus tax. The charges of monthly package are RS 50 plus tax. This service is available for prepaid and postpaid customers. This telecommunication keeps rights to change activation fees at anytime without being informed of consumers. This service is not included with other Telenor Packages.